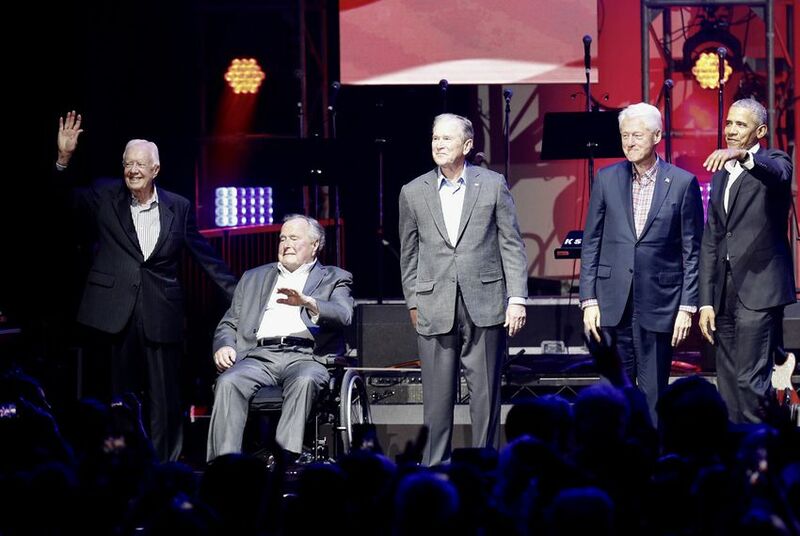 All five living former U.S. presidents gathered at Texas A&M University Saturday night to raise money to benefit the victims of hurricanes Harvey, Irma and Maria. COLLEGE STATION — A high-spirited, Aggie-filled crowd of 10,000 roared to life Saturday evening as all five living former presidents took the stage at a benefit concert for the victims of hurricanes Harvey, Irma and Maria. Gathered under the championship banners in Texas A&M’s Reed Arena, Jimmy Carter, George H.W. Bush, Bill Clinton, George W. Bush and Barack Obama thanked donors for their generosity and emphasized the importance of supporting the millions affected by recent natural disasters. Guests in the packed stadium — including U.S. Sen. Ted Cruz, Gov. Greg Abbott, House Speaker Joe Straus, Lt. Gov. 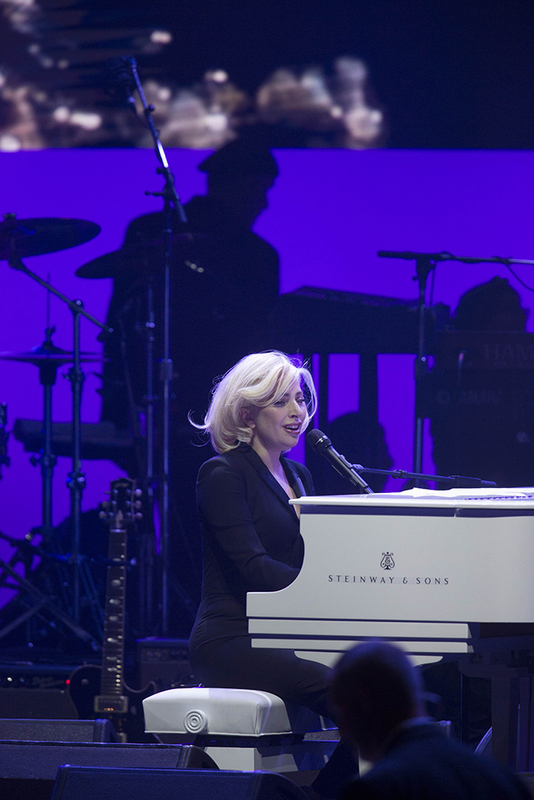 Dan Patrick, U.S. Rep. Bill Flores and Houston Mayor Sylvester Turner — then settled in for performances from a formidable slate of musicians, including Alabama, A&M alumnus Lyle Lovett and Lady Gaga, whose surprise appearance received perhaps the loudest applause of the night. 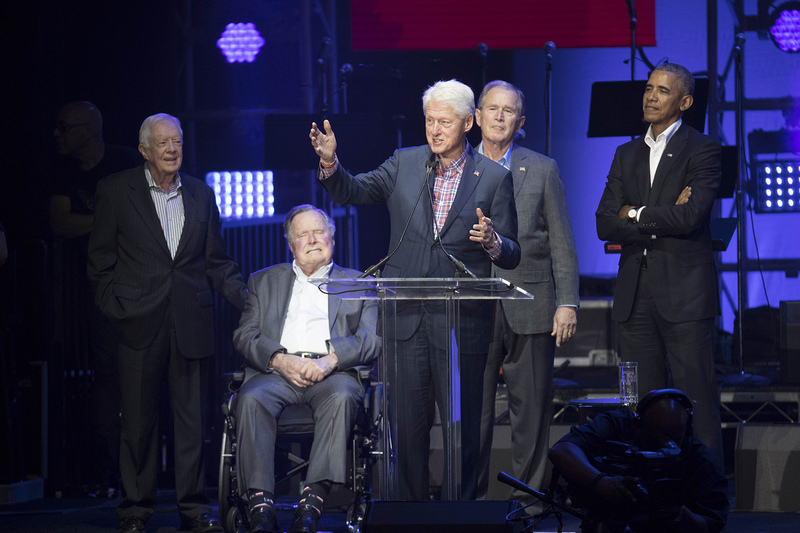 The five former presidents joined forces earlier this fall to launch the “One America Appeal” fundraising initiative, an effort initially targeted at Harvey victims that has since expanded to include those impacted by hurricanes Irma and Maria. They announced the benefit concert earlier this month. As of Saturday evening, fundraising totaled over $31 million from 80,000 donors; organizers announced Tuesday that an additional $2.6 million has been raised since the concert. The money will be split among a number of groups working in Texas, Florida, Puerto Rico and the Virgin Islands. President Donald Trump, in a pre-taped message to the audience, thanked his predecessors for their work and called for the country to come together after the recent natural disasters. "This wonderful effort reminds us that we truly are one nation under God, all unified by our values and our devotion to one another,” Trump said from three video screens. Minutes later, from the stage, Clinton seemed to call out the Trump administration’s response to the devastation in Puerto Rico. “Our friends in Puerto Rico and the American Virgin Islands have only begun to dig their way out of what could still be a calamitous disaster, but can be a new beginning — if we just do what we ought to do,” he said. Politics aside, the crowd was spirited throughout the night, giving numerous standing ovations and cheering especially loudly at any mention of their home state. Two lines from Lee Greenwood’s “God Bless the USA” — “the plains of Texas” and “from Detroit down to Houston” — were greeted with particular enthusiasm. Speakers and musicians kept their attention focused on the heroism that followed the hurricanes' devastation. The five former presidents honored five volunteers, whose efforts included designing an app to aid rescue efforts and mobilize thousands to rebuild Houston homes, and thanked everyone who donated time or money to hurricane victims. The donations demonstrate the resiliency of the American spirit, they said. As the Gatlin Brothers sang during their set: “Who are these good people? Americans, that’s who."